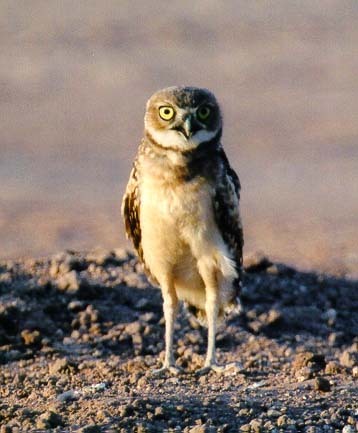 Typically, Wild At Heart is involved in removing Burrowing Owls from agricultural areas. At the Maricopa Agricultural Center (MAC), a University of Arizona research farm (http://ag.arizona.edu/aes/mac/), it became possible to relocate owls because the farm will remain a working farm for the foreseeable future. A high food source area, the farm was already home to many Burrowing Owls living in natural burrows along the Santa Cruz wash and the borders of some of the farm fields. With the help of Dr. Dave Langston, an entomologist and the superintendent of the facility, sites were identified where the artificial burrows could be installed. The MAC staff could not have been more helpful to this project. The ground was built up to make sure the burrows could not flood and many people pitched in to get the artificial burrows installed. Dr. Langston also put us in touch with Bart Romero at Maricopa High School so his Spring semester 2003 FFA students could help with release tent construction and feeding the owls. With MAC's help more people in the community were able to get involved. Thank you! Below see some views of the site, including fledgling Burrowing Owls that were brooded while the owls were still in the release tents. All photos by Greg Clark. Dave Langston pitches in to help with dirt removal for one of the artificial burrow trenches. Groups of 16 burrows were installed very close together on dirt platforms. 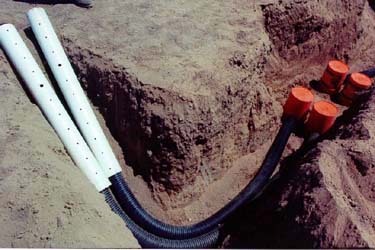 Shown here are four plastic buckets used for burrows and two of the entrance tubes. The black 4-inch corrugated and perforated plastic tubing is protected by 6-inch rigid sewer pipe. The rigid pipe prevents dogs from chewing on the black plastic tubing. It is possible to put two burrows in one trench. This cuts down the amount of backhoe work by 50%. This shows two of the release tents at MAC. 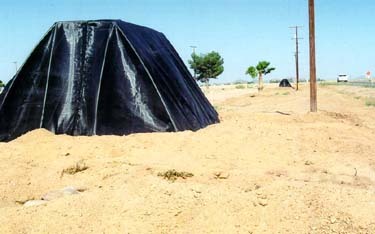 Each tent covers 8 artificial burrows and there are an additional 8 burrows outside each tent. 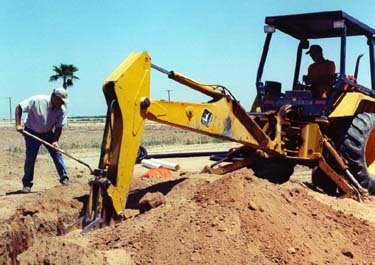 As of July 2003 there are 64 installed artificial burrows at the site. 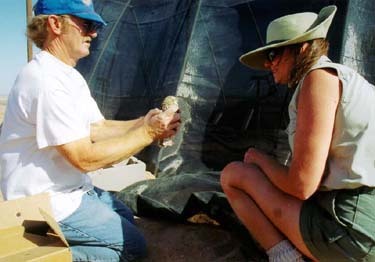 Lori, aWild At Heart volunteer, helps Bob Fox release one of the Burrowing Owls into the tent. Each day for one month, one of the Maricopa High School student volunteers brought mice provided by Wild At Heart to each tent. Before the owls are released into the tents they are held at Wild At Heart in Cave Creek for at least 90 days. This time is required to break the site fidelity to the location where the owl formerly lived. All the owls are banded with U.S. Fish and Wildlife Service bands. After one month in the tent the owls have a new site fidelity and generally stay at the new site. The owls that are released into one tent were previously housed together in Cave Creek. This keeps mated pairs and family groups together at the new site. After one month the release tents are removed and the owls are free to go. Some owls choose to move to the expansion burrows outside the tent. 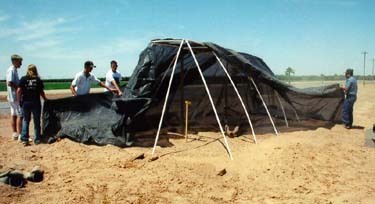 In the Spring of 2003 the owls liked the new sites so well that they began egg laying in the tents. The owls were released into two tents at the end of April 2003, and the tents were removed at the end of May 2003. 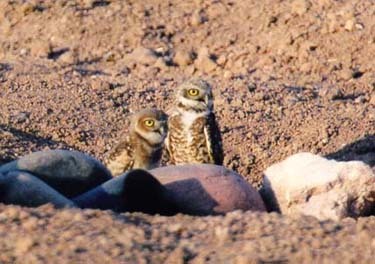 At the beginning of July 2003 juvenile Burrowing Owls appeared at both release sites. Because the incubation time is 21-28 days, and it takes 28 days for the owls to fledge and leave the burrow, the eggs had to be laid shortly after the owls were released into the tents. One of the watchful female Burrowing Owls with one of her seven juveniles. One release site produced at least seven juveniles and the other produced at least three juveniles approximately two months after release into the tents. While the female Burrowing Owl is brooding the eggs the male brings her food. After the eggs hatch he brings food for everybody. One of the seven juveniles at one site at Maricopa Agricultural Center. Note the plain unmarked breast feather color compared to the adult's heavily marked breast plumage. This juvenile has the same bright yellow eye color of the adults. Not all juveniles have this eye color. Some display a a faint yellow or gray color. See the video of one of the MAC juvenile Burrowing Owls as it comes up to the camera and gives the camera a threat display. The camera was unattended, but it was a new thing near the burrow. On the video you will also see some of the other owls drop by to say hello. b i r d i n f o @ m i r r o r - p o l e . c o m.
You will need to type it in manually and eliminate the spaces.